Activation of the reader: the buyer can sit in the position he wants and turn on the reader by pressing the black button. Start: the computer control system of auction turns on that command and the buy button. Bids and purchases: once operational, the buyer can press the red button when he wants to buy a product. What are the necessary equipment for auctions? 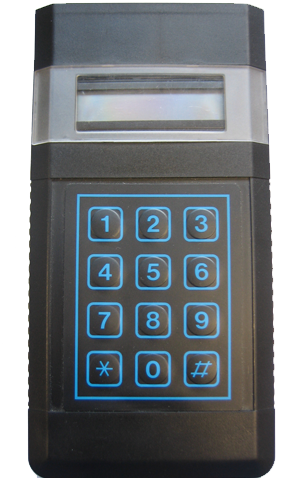 The RFID reader activates the command simply by inserting a card buyer, without physical contact between the card and the reader, avoiding scuffs, dirt, etc. It allows the buyer indicate the amount of fresh or frozen fish that he wants to buy and introduce his code like consumer. Command to stop the auction that works without wiring. Electronic equipment necessary to manage the remotes of the buyer. Fits all models of command. It was tailored to each customer according to their needs, it’s used to show the most important data of the product being auctioned and the buyer who makes the stop and the amount he gets. It was tailored to each customer according to their needs, it’s used to show the price at the auction and they are installed at various points to facilitate viewing of the price.